Movement or “caliber” is the heart, the engine of a watch. There are many types of movements with their own pros and cons. 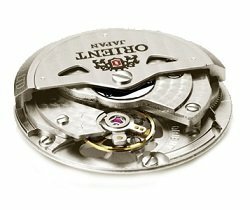 This article will give you an overview of watch movements including traditional mechanical, quartz, Kinetic, solar-powered and digital movements. Mechanical watches account for most of luxury watches because of their sophisticated mechanism which requires high level of craftsmanship. Mechanical movements harness energy stored in a periodically-wound spring. There are two types of mechanical movements, manual and automatic ones. Both of them are made of mechanical parts namely spring and gears. Manual wound or hand-wound watches are the oldest type of watch movement. They are popular not only for being the very first wristwatch calibers but also for the exhibition of their sophisticated structure through the transparent case back. The wearer need to turn the crown a lot of times to wind the mainspring and store energy. The mainspring will unwind gradually and transmit energy through the gears and springs to advance the hands. Some wearers find winding their watches everyday a relaxing hobby but some finds it annoying, so hand-winding mechanical movements have evolved to self-winding movements. 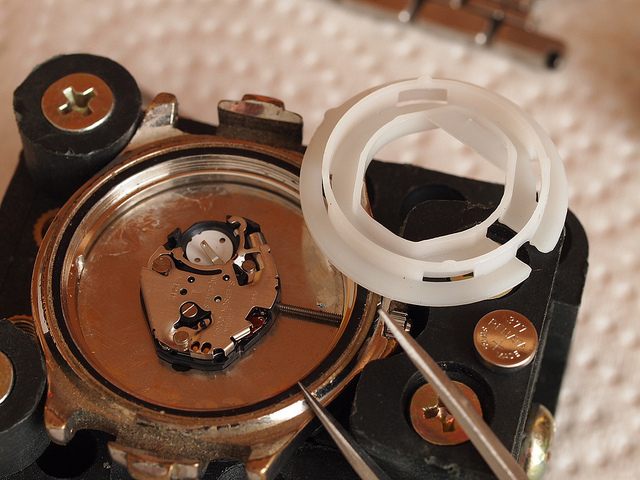 Instead of manual winding, they use a semi-circle shaped metal weight called the rotor (some watches feature a quarter-circle rotor, Orient pieces are an example). It is connected to the caliber and can oscillate freely by the motion of the wearer’s wrist. The rotor spins, transfers energy and winds the mainspring. Your watch is wound automatically but if it is not worn for a long time, it will stop working. You have to wear your automatic watch at least every other day or use an auto-winder to keep it running. Watches with quartz movement are less expensive and desirable than those with mechanical movements due to the lack of craftsmanship. However, they are more accurate and require less maintenance than conventional mechanical calibers, except for battery changing. Quartz movements are powered by batteries so they don’t require daily winding or frequent use. This battery sends electricity to the quartz crystal. This quartz crystal vibrates and creates pulses with a precise frequency. These pulses are sent via an integrated circuit to a stepping motor advancing the watch hands. Quartz watches are popular thanks to lower prices and less maintenance. They also tend to be lighter than mechanical ones and don’t need constant use. Kinetic movements are considered a hybrid of automatic mechanical and quartz technology. A kinetic watch works in the same way with a quartz one. It also uses quartz crystal. However, instead of using batteries it generates its own electrical power by using a semi-circle metal weight like in a mechanical watch. Kinetic technology is considered one of the most advanced technologies in the field of timepiece industry. This type of movement has both advantages of automatic and quartz technology. A kinetic watch is not only accurate but also convenient it will not die even when you stop using for a long time, it can store enough energy to operate for a week after a full charge. Another major advantage of Kinetic movements is its environmental friendliness. They use clean and natural energy- the motion of the wearers’ arm. What’s not to love is that this type of movement requires even more space than mechanical one, as a result, your watch case has to get thicker. I personally don’t like watch case which is too thick! In an effort of using clean energy, solar-powered movements are developed. In essence, these movements are a kind of quartz caliber. The difference is the source of energy, a solar-powered watch absorbs energy from sunlight or even artificial light by a solar panel. This solar panel converts light energy into electrical power to run the watch. Energy is usually stored in a rechargeable battery for use when light is not available. Solar-powered technology is popular for its accuracy, green energy and minimal maintenance. Seiko & Citizen are the 2 most popular brands when it comes to solar-powered wristwatches. Digital movements are powered by battery. They also use a crystal oscillator to generate an accurate 60-hertz signal. This signal is then analyzed electronically to hour and minute. The greatest advantage of digital technology is its outstanding accuracy & low price. A 10-buck digital piece can make a much better time telling tool than a $30.000 Rolex watch. Digital pieces are usually treated as beater watches, not fashion accessories, simply because they’re not dressy. Casio G-Shock is the No.1 option when it comes to digital watches.